Whether you’re making replacements or starting fresh, this simple method for sewing chair cushion covers doesn’t require a lot of equipment or advanced sewing skills. There are no box pleats, zippers or fancy stitching. The project takes less than an hour, and the same technique can be used for throw pillows and bed pillows. It can be used with the chair’s existing padding, new foam rubber or cotton batting. Freshen the look of your seat cushions by following these steps. Remove the old chair cushion covers and decide whether you want to reuse the stuffing or foam rubber. Batting or foam rubber that has become compacted or that is soiled shouldn’t be reused. Measure the seat, and buy the same size and shape foam as the original. Read the package on the batting to determine how much you need for your cushion size. Purchase a fabric piece that is twice the size of one of the large sides of the cushion plus enough overlap on each side to form a seam. If your foam is 2 inches thick, add 1 ¼ inches to the fabric around each side. This gives you 2 inches of fabric to cover the sides of the cushion plus ½ inch for a seam. Fold the fabric in half lengthwise, and cut it into two equal pieces. Turn the right sides together, and use straight pins to pin together three of the sides. Sew the three sides together, and remove the pins. Turn the fabric right side out. It should resemble a pillowcase. Slide the foam rubber into the pillowcase or stuff it with batting. Batting should be stuffed very tight because it will compress when sat on. Fold each edge of the fabric along the open side. Place one folded side over the other, and pin the two sides together. Be sure to pull the fabric tight so that there are no wrinkles or loose areas. Sew the seam together using a backstitch. Knot the end of the thread, and then make a few small stitches over each other on one end of the pinned seam. Then make a small stitch, move your needle forward the same length as the stitch, and make another. Bring your needle back to the space, and make a stitch that is the same length as the space. Continue until you’ve come to the other end of the seam, and take a few small stitches there. 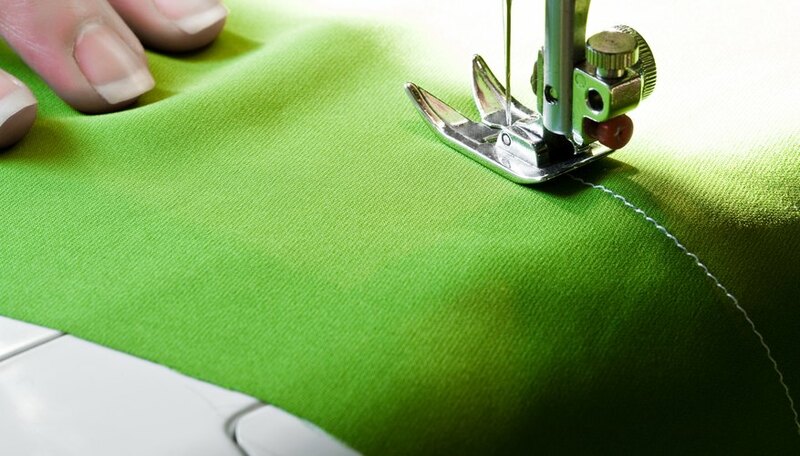 If you do not have a sewing machine, hand stitch the first three sides. Make sure to use small stitches to create a sturdy seam. The small stitches at each end of the seam reinforce it so that it doesn’t come undone. If you use a fabric with a pattern, consider whether you’ll match the pattern at the seams. If you will, allow extra fabric.